Occasionally, I do something really dumb and wonder how I could have been so clueless. Sadly, doing stupid things has not disappeared with age. I don’t usually state my major blunders in public, but my latest mistake is one from which some might learn. Three years ago, two young men from Eugene were not so fortunate and drowned. I wasn’t in danger, but I did something foolish, ruining my camera in the process. I am new to the West Coast. 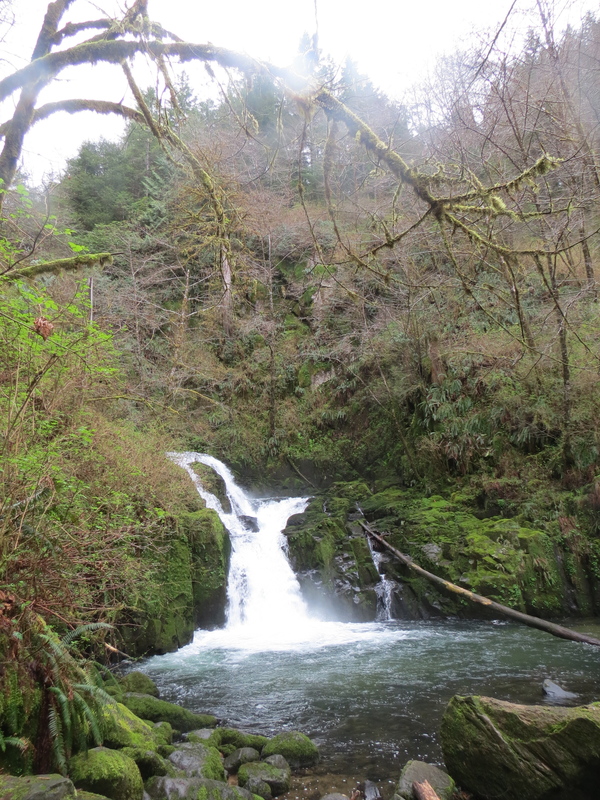 I am exploring Oregon by hiking; while I have extensive experience in the woods of northern Minnesota and the high country of Arizona, Oregon is different. I have hiked in Washington State before, and I know about slippery rocks, need to carry rain gear, and taking the usual essentials before setting off alone. Indeed, when I drove west to Sweet Creek Falls Trail, near Mapleton, I left a note on the kitchen counter, where I was going, what I expected to do, and the fact that the barometric pressure was steady when I left. Rain was forecast for later the day. I always leave notes when I hike alone. It makes searching for my remains easier. 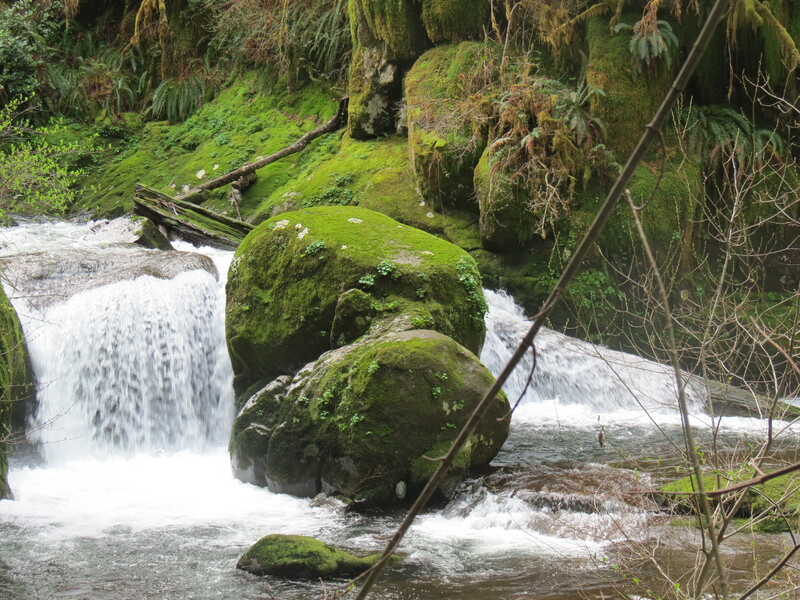 The hike was pretty, not difficult, along a lovely river, with only a few areas where I needed to be careful. However, I never forgot that a classmate in medical school died in 1973 when he fell on a rock in a stream and hit his head. Bad things may happen, and may happen suddenly. A slight misstep can become life-threatening or very inconvenient. I got a lesson in the latter this day. When I finished the hike, I decided to drive to the coast. It was only 20 miles, and I thought it worth visiting the coast of my new home state. When I arrived at the long stretch of dunes, south of Florence, I found a deserted parking lot and texted my wife where I was. I had deviated from my planned route, and any time I do such, I MUST communicate. In the canoe country, I cannot, so if I am alone, I NEVER deviate from my route. This is smart; what I did later wasn’t. 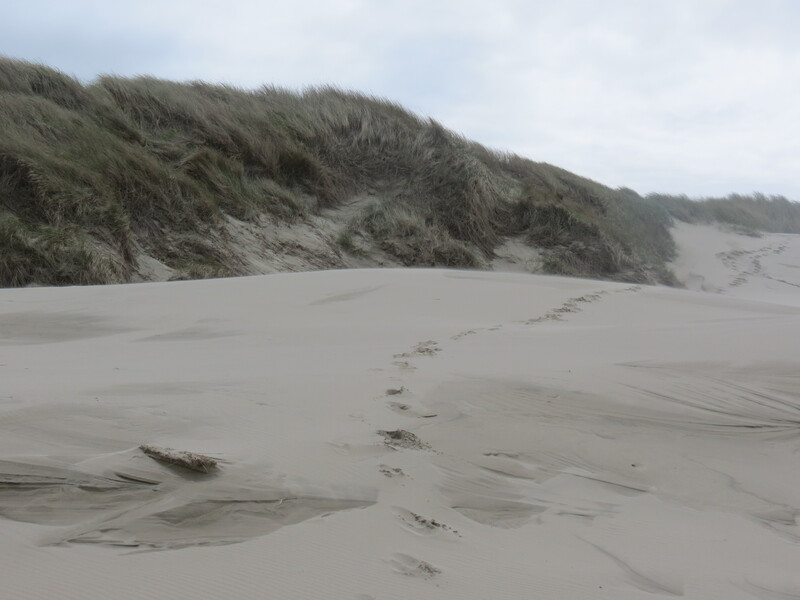 I went over the dunes, walking down to the nearly flat beach. The waves were high, but there was a lot of wet beach that waves did not come up to often. But wet beach=water, and I did not appreciate that obvious sign. Suddenly, one wave appeared quickly. 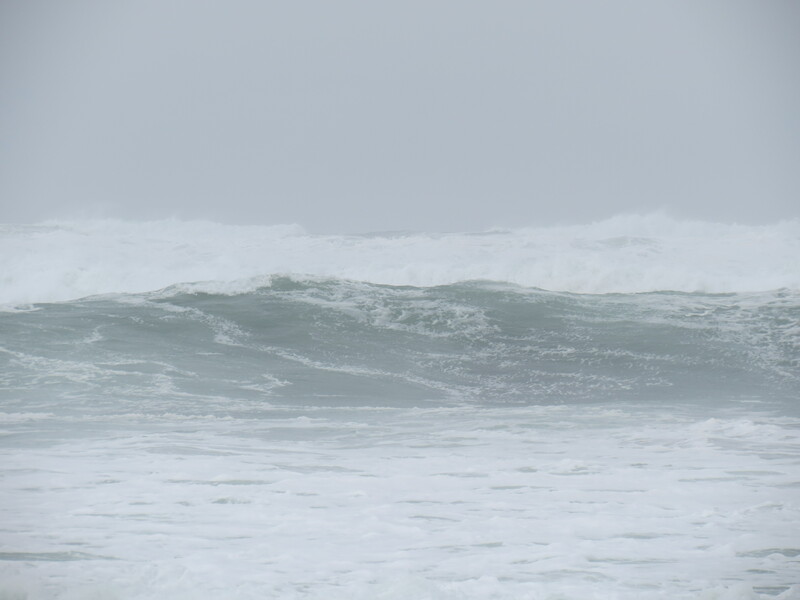 I started to walk, but the wave overtook me, water reaching mid-calf and into my boots. I laughed, thought it fun, as the shore was relatively flat, and wet feet weren’t going to ruin my day. The ocean had warned me. Nature warns, but we have to listen. I did not. 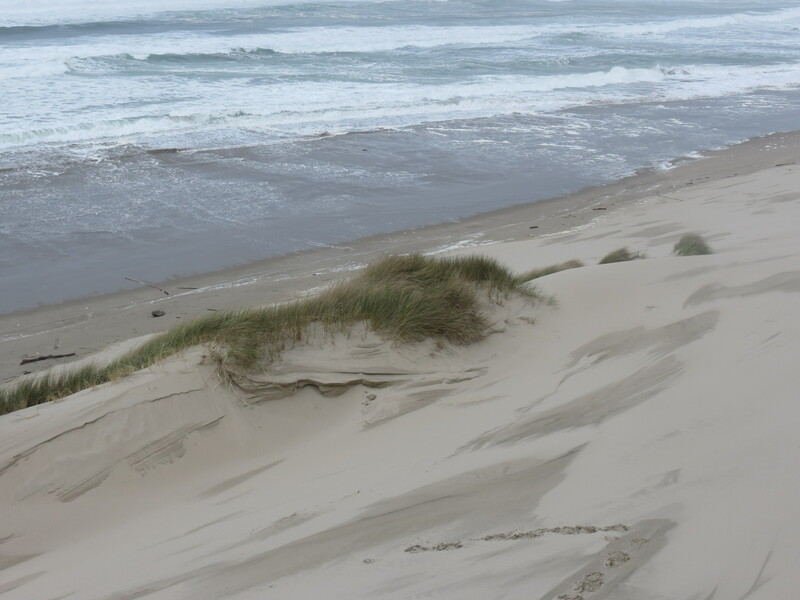 View at top of dunes, 50 ft (15 m) above ocean. 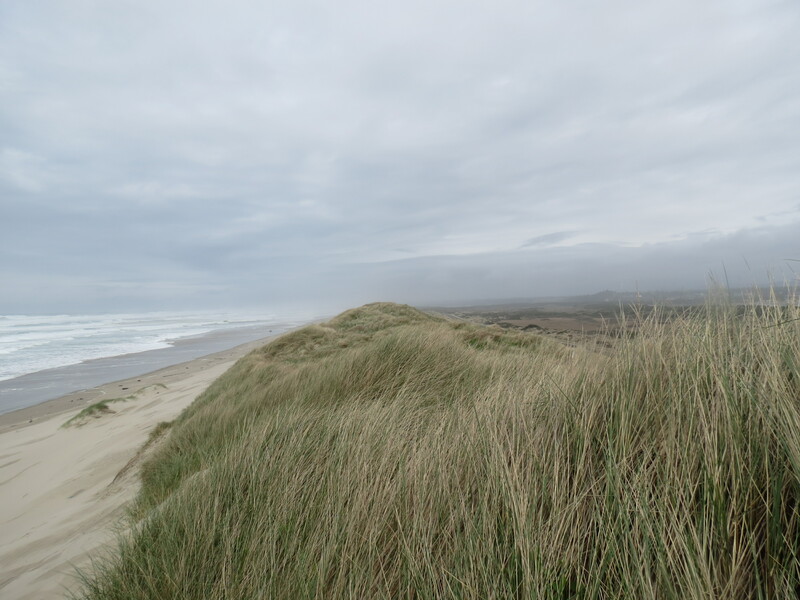 View of the ocean from the dunes. The small log where I sat is left of center, on the beach. 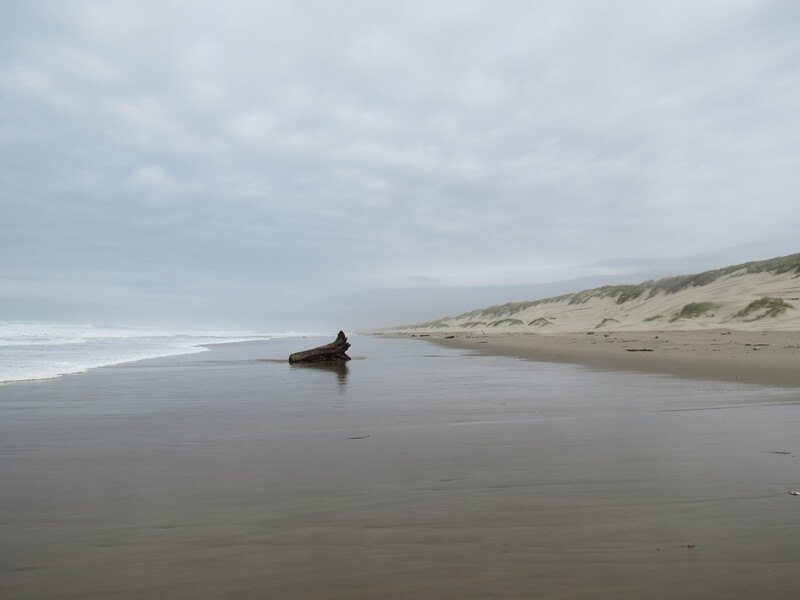 I continued further south along the beach, climbing into the dunes, taking pictures of the ocean, the dark clouds that would herald rain later, and returned to where I came into the beach. I constantly monitor the sky, I am less good about monitoring the ocean. I saw a large log, 18 inches in diameter and several feet long, with perhaps a foot wide flat surface on top. I stood on the log, timed the swells, curious as how often a big wave would come in. Nearly all waves crested about 50 yards away. Soon to be a sneaker wave. No way to tell, except no water was flowing back into the ocean at the time. Last picture taken from my camera. The log where I stood, Notice how far up the water was capable of going. Suddenly, one large one came in. I felt safe on the log, above the water, but I had forgotten something I really should know–the power of moving water. Two feet can float a car. The water wasn’t that deep, but it was moving at 5 mph. I could outrun it easily, but I could not walk faster than it. Nine inches of water, 5 mph, and a 8 foot log is struck by 45 cubic feet of water a second–nearly a ton and a half. This is equivalent to 3 defensive line football players running and hitting the log. The force knocked me into the shallow, flowing stream. I saw my camera under water; I took my phone out of my upward facing pocket, stunned, as I always am, when “this can’t be happening to me” happens to me. I got up, upset at myself, deeply embarrassed, muttered, “you really should know better,” and returned to the car. I was soaked. I started the car, turned on the heat, began drying my phone. The phone worked later, as did the SD card in the camera; the camera itself did not. I was alive; other than a lot of sand and wet clothes, I would eventually clean myself, the car, the garage, and those few places in the house I had tracked sand. Thirty-seven months earlier, two young men from Eugene were standing on rocks out in the ocean near Yachats when a sneaker wave threw both into the cold ocean. The rocks were too slippery to climb out; they died from hypothermia. We all make mistakes, be it going up on a ladder when we shouldn’t, being outside when there is lightning, shooting rapids, or getting too close to the ocean. What we must keep in mind are potential dangers and how rapidly things can go south. Sneaker waves? I know what they are…now. I got away lucky. I won’t get caught again. Ever. I wonder what the next stupid thing I will do will be. Or whether I will be lucky. This entry was posted on March 19, 2014 at 09:38 and is filed under MY WRITING, UNPUBLISHED OUTDOOR WRITING. You can follow any responses to this entry through the RSS 2.0 feed. You can leave a response, or trackback from your own site.